Of all the various methods of purification, surface and depth filtration forms a basic type of filtration procedure. Let us discuss both of them in a little detail. Surface Filtration– As the name depicts, surface filtration is concerned with retention of particles mostly on the surface itself. The particles retained forms a layer of material, commonly called “cake layer”, which helps increasing the efficiency of filtration furthermore. If the rate of filtration initially is around 50-60% then after the layer of cake is formed, it grows to 100%. The filter medium is a permeable or semi-permeable membrane arranged in such a way to collect some or all of the suspended material, across the flow of a suspension. Compared with the diameter of the smallest particle to be filtered, if this sheath of filter is thin, then the filtration process is expected to take place on the upstream surface of the medium. If the particles are considered solid, then the particles smaller than the diameter of the pore would pass through it and the bigger ones would get stuck remaining on the upstream surface. However there would be some larger particles that would settle on the surface blocking the pores. Gradually the medium surface would be filled with these particles, posing a hindrance to the rate of filtration thus reducing to fluid flow beyond acceptable limits. At this point, the filtration needs to be ceased and the medium surface has to be cleaned properly to continue the process of purification. As the above process works on the basis of the relation between the pore size of the medium and the particle size, this mechanism of filtration is also known as Surface Straining. The straining separates solid units in the feed suspension completely depending on the pore size of the filter medium; if at all particles are not easily deformable. Here the working mechanism involves transmission through a perforated plate or a solitary sheet of woven wire or plastic mesh of detailed weaves. Also relevant in the range of metal edge and analogous cartridges where the pores are accurately formed slots between contiguous discs or turns of a helical strip. 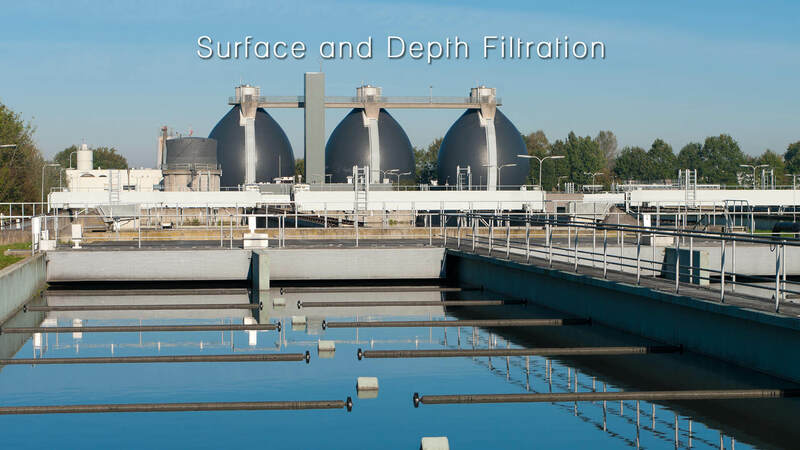 Depth Filtration– Depth filtration forms a tortuous path with multiple layers that helps in holding back the particles with larger ones at the surface and finer at inner layers. The medium here is thick. Thus particles can be confined in the stratums of fibres by the mechanism of adsorption so as to arrest the finer elements on the meandering path with irregular pores on the surface by the procedure of direct or inertial interception or diffusion. Also sometimes blockage of the pores occurs due to the matters getting entrapped with one another and not particularly posing obstacle to the minute openings, as the fluid can still flow through the gaps between the particles. However a reverse flow of fluid is necessary to get the sheath rid of the clogged channels or needs to be thrown away completely. A majority of real media are definitely not noticeably thin. In fact they have a determinate or finite thickness in the course of the fluid flow. Most of the pores through such material differ in diameter along the trail of the fluid. The particles move through the layers to a point where they are obstructed by the finer pores and hence get trapped due to its size. The pores get blocked in the process and hence needs to be cleaned for further usage through a reverse flow of the fluid or the medium has to be discarded totally and replaced with a new one. This is known as Depth Straining. Practically and also effectively, the effects of both Depth Filtration and Depth Straining are the same. In both the cases the filter medium gets choked due to accumulation of the particles in the pores and is challenging to isolate. Hence they are generally grouped in the same title head of Depth Filtration. Compared with Surface Filtration, Depth Filtration is a bit expensive but at the same time it lasts for a longer time period. However, the choice of filter mechanism absolutely depends on the usage it has to be put for.